I have been sitting on these cupcakes for weeks now. Which was exactly twenty-six days ago. I know, I am so sorry, and also completely shocked, that I am just now posting them. I mean, I have never, not once held on to a post that long. This is for sure a record. Meaning this never, ever, happens. Normally you guys see posts a couple days after I make something. Sometimes I’ll even post it the very next day. When that happens it means I am crazy excited about whatever the posted food is. Meaning it’s crazy good and I cannot contain, nor control, my excitement. Meaning I must blab on and on about it the very next day. Because honestly, these are so stinkin’ good. Like crazy insane, rock your world good. I just wish I still had at least a few. Cause I promise I can so remember what these cupcakes tasted like. I made them the day before I went to South Carolina. This meant I had twelve cupcakes and me. Now sure, I probably could have downed them all myself. No I could have, but I did not want to end up with a giant stomach ache all night and then have to get up and get on an airplane at three in the morning. So I did the nicer and smarter thing and gave a few to the worker dudes next door. Yeah, they really liked me after that. Pretty sure the next day when I made these burgers they were looking over wishing I was giving those to them too, but my brother ate those. Sorry guys. Maybe if you guys are still around in August when I get home you’ll get some then. These cupcakes have it all going on. The sweet, the salty, the peanutty and even the boozy. Ah yes, you better believe I added at least a little scotch to my butter scotch sauce. It is obviously totally optional, but highly recommended. Oh and the frosting is amazing!! So good. Just make it. Eat with a spoon and go to your happy place. 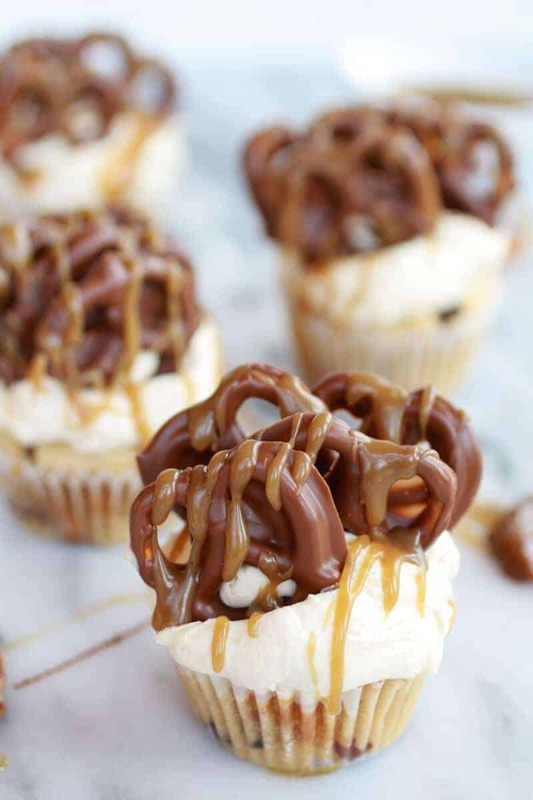 Seriously, though these cupcakes will become your happy place. And yes, I know I am asking you to turn on your oven for these, but I promise they are worth every ounce of sweat you drip to make them. 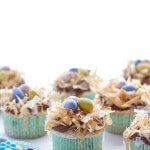 These cupcakes are sweet, salty, peanutty and even boozy. To make the butterscotch sauce. Melt the butter in a small sauce pot. Add the brown sugar, heavy cream and salt. Bring to a boil and then reduce heat to medium. Boil for 3 to 4 minutes. Remove from heat and stir in the vanilla and scotch, if using. Set a side to cool until ready to make the frosting. You may also use a double broiler. Dip each pretzel in chocolate, allowing excess to drip off. Place on wax paper lined cookie sheets and chill in the freezer until firm. Mix the canola oil and peanut butter together in the bowl of an electric mixer until smooth and creamy. Add brown sugar, sugar and eggs and beat together until fluffy. Add vanilla. Combine dry ingredients in a bowl. Add half of the dry ingredients, mixing until just combined. Once mixed, add remaining dry ingredients. Add the milk and mix well. Fold in butterscotch chips. 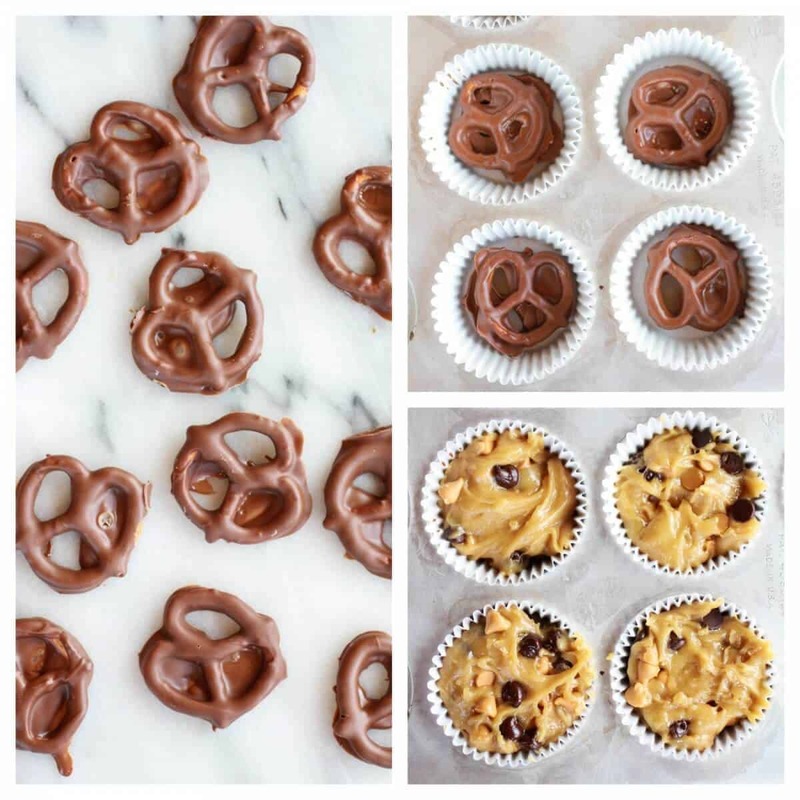 Remove the chocolate covered pretzels from the freezer and place 1 or 2 in the bottom of each cupcake tin. Pour the batter into cupcake tins right over the chocolate covered pretzels and fill 2/3 of the way full. Bake for 15-20 minutes at 350. Let cool, then frost. While the cupcakes bake, make the frosting. In the bowl of a stand mixer beat together the butter and powdered sugar until smooth and fluffy. Beat in the 1/2 cup butterscotch sauce until completely combined. To assemble, pipe the fristing onto the cooled cupcakes. 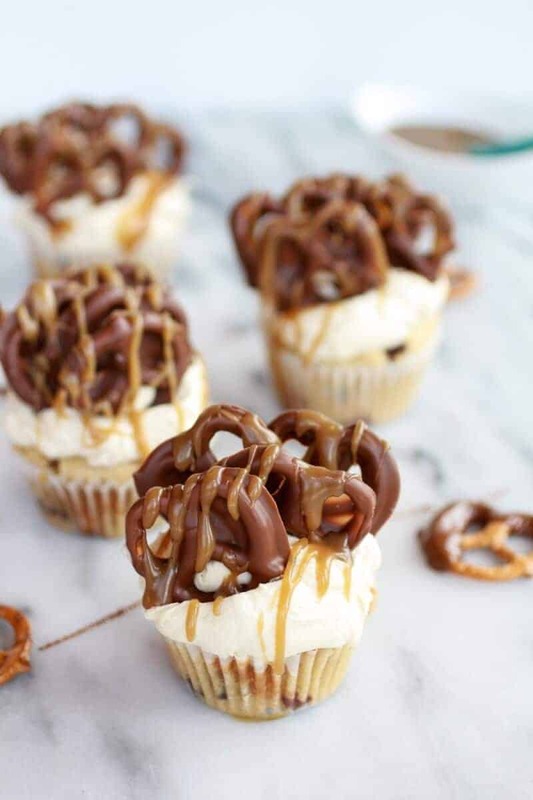 Garnish each cupcake with the chocolate covered pretzels. 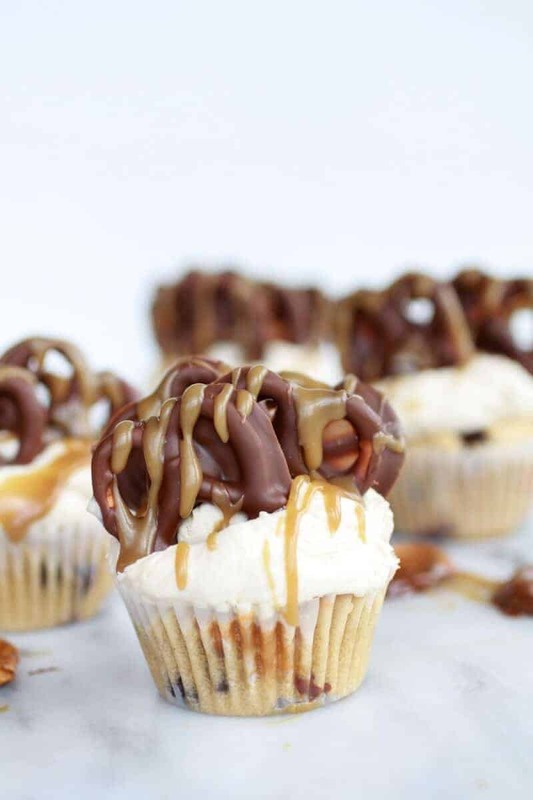 Then when ready to serve, generously drizzle cupcakes with the remaining butterscotch sauce. If your kitchen is hot keep the chocolate covered pretzels in the fridge until ready to eat. If you have a cool kitchen they will probably be fine on the counter. Can’t even help it. I must make more (especially after my mom sees this post, then I really won’t have a choice). Really, I must. 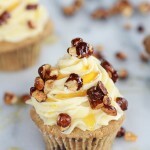 I just posted peanuts + butterscotch today too – I am huge, huge fan of the combo and your cupcakes look amazing!!!!!! The boozy butterscotch sauce has got to be like the best thing ever. And that there are choc covered pretzels everywhere in these babies – all the texture, salty, sweet, crunchy, soft, fluffy. Just everything in one. Love them! Pinned! The boozy butterscotch sauce is truly the best thing ever. So good!! Funny that we posted similar flavors on the same day!! your cookies are killing me. They look amazing! Thanks so much for pinning, Averie! Haha! I know, I am so sorry!! 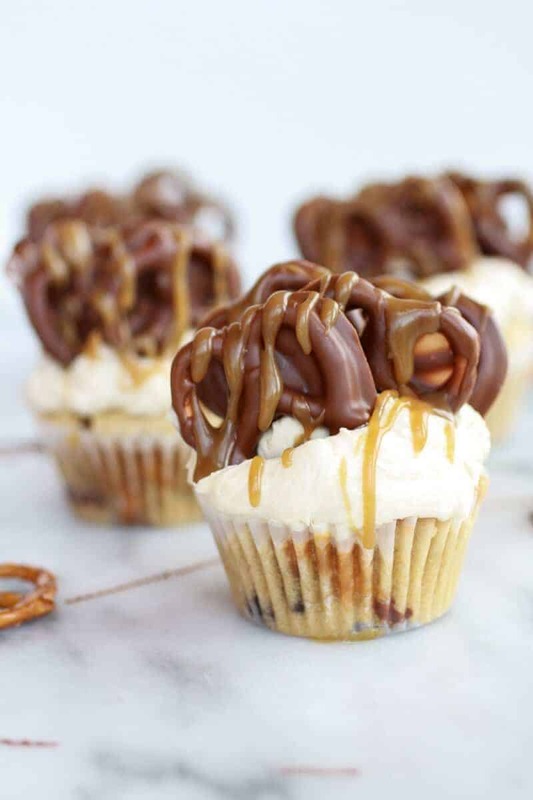 Oh my gosh, chocolate covered pretzels at the bottom of a cupcake? That is insane and I love it! The booze just pushed it over the edge! Thank you so much, Christina!! 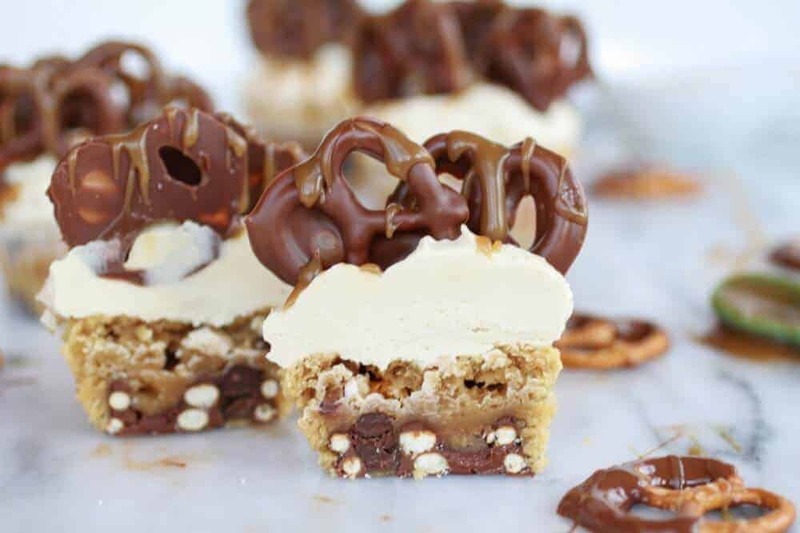 The pretzels in the bottom are so good and yes, the booze really does put them over the edge! These look incredible! Sweet and salty perfection! Oh man, I am not sure I could plan that far ahead! way to go you!! Chocolate covered pretzels! Man, peanut butter and butterscotch is such an amazing combo and these just put it over the edge! I agree! Thank you so much, Mary! Holy freaking moly! I love the combo of butterscotch and peanuts! Sweet and salty is my absolute FAVE! Only thing is, I honestly cannot stand making cupcakes… I’ve only made them probably like 5 times- they’re always so much work. But these look worth it and then some! Oh no! I love making cupcakes because most times I can always make them look cute and well they are always delicious! Hope you give these are try and change your mind about cupcakes. I promise, they are not hard! 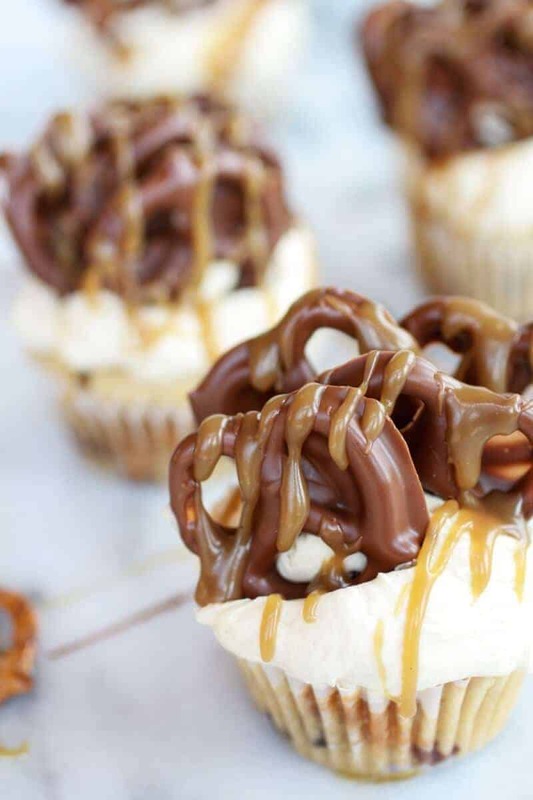 These look like Chocolate Covered Pretzel Heaven! Ha, they kind of are! Thank you, Victoria! Haha! Thank you so much, Shelly! That means the world coming from you! That is my kind of cupcake. Love that pretzel on the bottom, how cool is that. Would be demolished at my house too. Haha! Thank you so much, Paula! 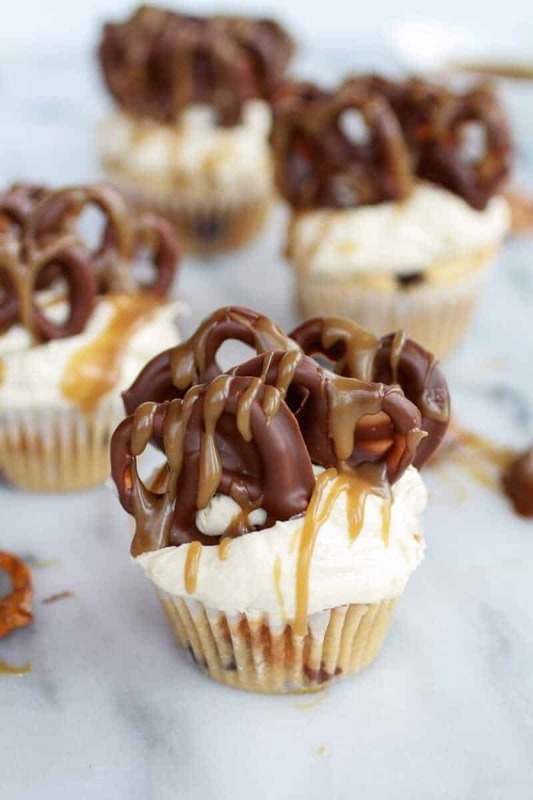 the cupcakes sounds wounderful but those pretzel toppings take the cake! Or should I say.. cupcake! wow! Hehe! Thank you so much, Angie! The pretzels rule! Just stop it! 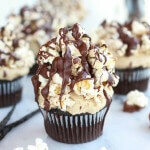 These look so incredibly decadent and over-the-top in the best way! I want every bit of them! Thank you, Mercedes!! They truly are so good! I can’t believe you withheld these from us either! They look amazing. I know, I am so sorry!! Never again! Those look amazing! I love the salty pretzels with the boozy frosting, so perfect! The boozy frosting is the best! Honestly, so good! Thank you, Hannah! The pretzels in the bottom are delicious! These are sort of over the top but over the top wonderful. All flavors I love. When you were in Colorado you should have come to visit…and you could have brought me some! Don’t worry, I’ll be back home soon! Only a few more weeks here in Oregon. I miss my colorado mountains and my nice comfy house! LOL! Wow the topping alone looks great! Haha! Yes! Thanks so much, Nessa! HECK yes, there is nothing better than the combination of sweet and salty. The salty pretzels… covered in delicious chocolate. Man I am making myself drool all over again. I need these in my life! Thank you so much!! I love the sweet and salty combo so much! I want to reach through the screen and grab a handful of these cupcakes! Tieghan, you are a baking genius. Truly my idol. So many amazing flavor combinations in such unique ways! I love visiting your website! You always have me in awe. I adore chocolate covered pretzels SO much and butterscotch, too! YUM! Hehe! I was hoping you would like these!! I know how much you love chocolate covered pretzels!! Thanks so much for you nice words, Sally!! Everything about this needs to happen to my piehole. You’re such an inspiration, Tieghan! So smart and beautiful and creative .. I want to be you when I grow up. Haha! I don’t ever want to grow up. Ever!! Thanks so much, Hayley! You are too nice!! Sweet, salty, peanuty and boozy?! 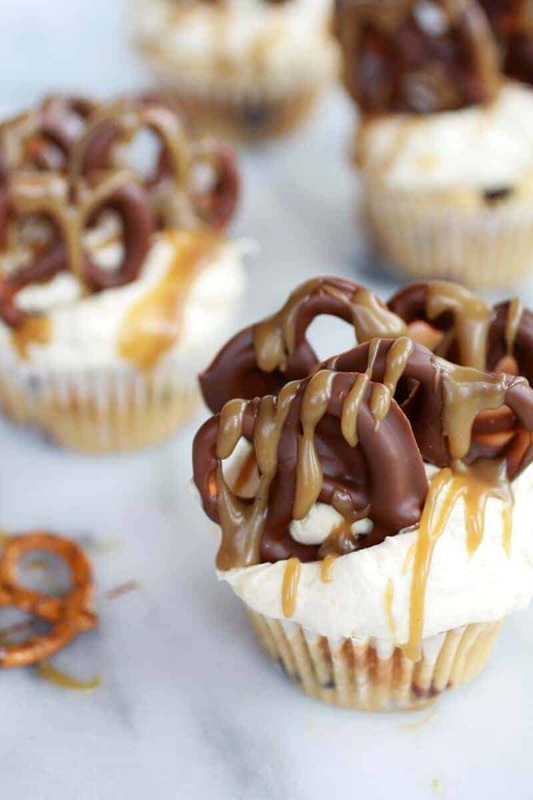 These cupcakes are perfection!! They look so delicious!! 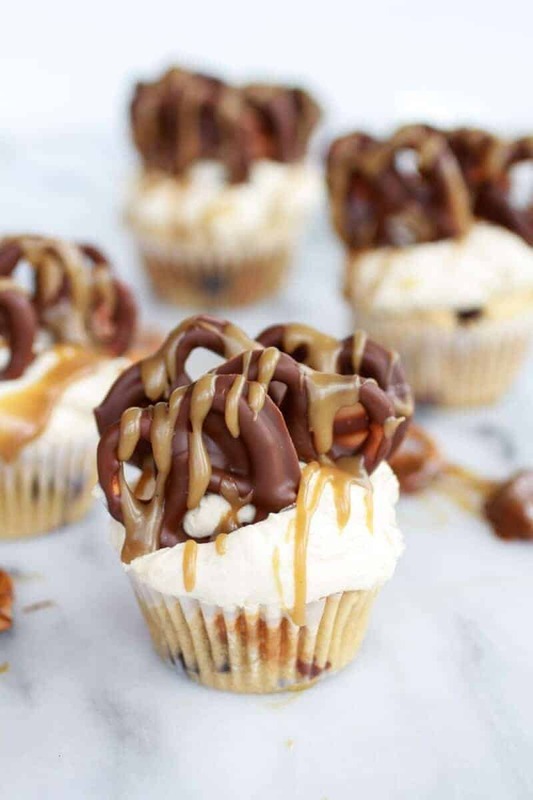 I’m looking at my oatmeal for breakfast right now and REALLY wishing I had one (or five) of these cupcakes in front of me instead. So yum!! Haha! Thanks Stephanie! Wishing I could send you some! I have so many posts I’ve never posted. But nothing like this – OMG! Haha! Thank you, Dorothy! Oh and post those post, I need to see them. I have a feeling they are awesome! Wow! These look fantabulously spectaculous! Yeah – I know those words dont exist – but I didn’t think this combination existed – till now – in a cupcake! Mmmmm, these look so decadent!! Thank you, Jocelyn! it is real decadent! Oh I hope you do! They are awesome. Let me know what you think! Can’t get enough of the salty/sweet combination, these look wonderful!! Thanks for linking up to What’s Cookin’ Wednesday! Oooh girl! Totally drooling over here 🙂 Pinned and featuring tonight! Thank you so much, Trish!!! I still need to stop by an link up! Hi! The cupcake says 1/4 cup of canola oil but instructions say cream butter and peanut butter together? Can I get clarification? Thanks! Making them now! It is a 1/4 cup canola oil, not butter (but if you used butter, no big deal). Just mix the canola oil with the peanut butter as directed. I just fixed the recipe. Hope these turn out great for you! Perfect, thank you! Used canola oil and they are in the oven as we speak! Yum! Hope they turned out awesome!! 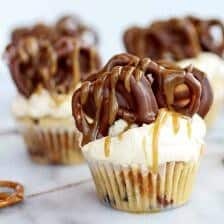 This is such a refreshing idea, I like these cupcakes very much.I’ve featured this recipe on my blog, hoping that you don’t mind, but if you do, please contact me and I’ll remove it. All the best. Hi Vera! So glad you like these and thanks for sharing! 1. Did you double the chocolate-pretzel combo in order for them to look this way? Seems like you would need 48 not 24. Do you double the chocolate as well? 2. 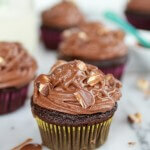 Can I use a chunky peanut butter in the cupcake? Thanks so much! I bought the pretzels at the store. Sorry, I have no idea how to make them. I made these tonight and they are yummy but they did not have a cake like texture. They were more dense nearer to a muffin or cookie . Did I do something wrong? Hmm, I am not sure. Did you follow the recipe as written?